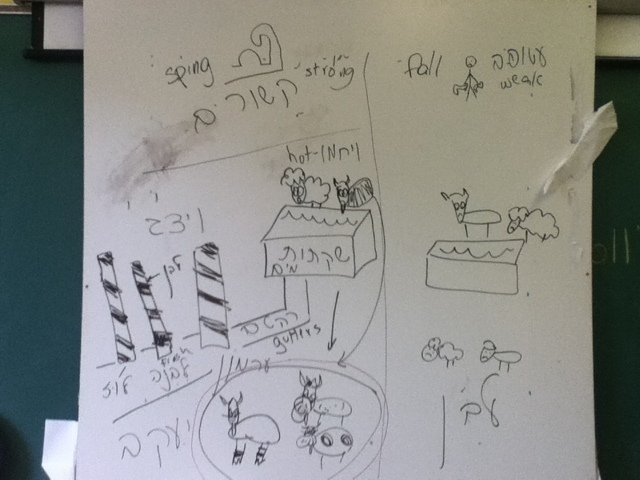 Tefillah: We had the second graders join us because of some substitute timing. We reviewed that Ashrei = Happy and what makes us happy. 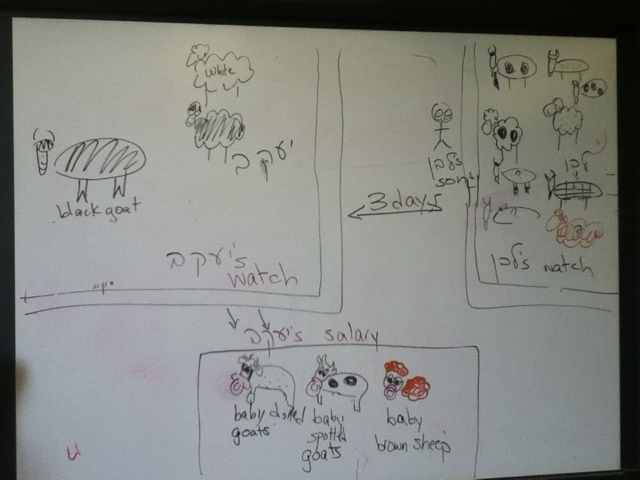 We then translated the first few lines of Ashrei until בכל יום. 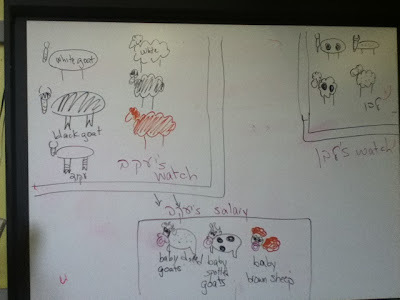 I asked the students if they needed to thank their mothers today if they already did so yesterday? Why would we need to bless and appreciate Hashem every day? Should our feelings of thanks to our mother be the same each and every day? Before we said Ashrei, we thought of something we are happy for. 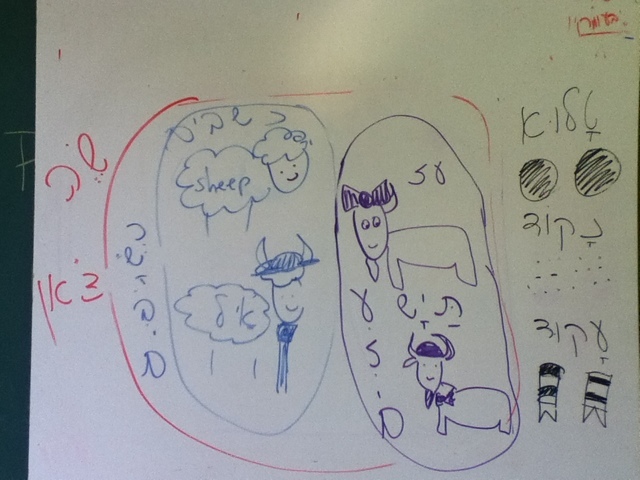 We paused before בכל יום to think of what we would thank Hashem for today! I explained basic genetics by surveying who in the class has blue eyes and who else in their family has blue eyes. dotted, spotted, ringed, any goats with white (some say any sheep that are white) and brown sheep. 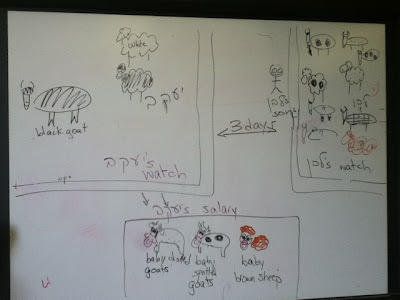 Leaving Yaakov with Black goats, black sheet and according to some white sheep. His salary stays the same. He takes three לח=fresh sticks-מקלות of לבנה, לוז, ערמון and stood (ויצג) them in the gutters (רהטים) of the water troughs (שקתות מים) The goats would get excited (hot ויחמו) when looking at the sticks and have dotted & spotted babies. 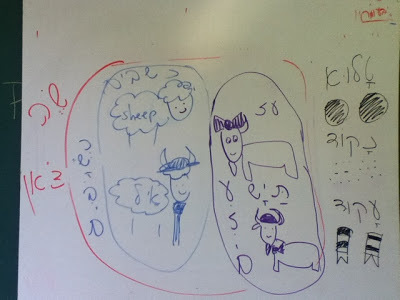 He did this with the קשורים – the strong ones, for the weak ones – the עטופים – he didn’t use this trick so lavan got sick sheep and יעקב got a lot of good sheep. I also gave out Pirkei Avos Perek 3 to learn over Shabbos.